Lewis Kaplan, co-founder and longtime artistic director of the Bowdoin International Music Festival, plans to launch an early summer classical music festival in Portland that will celebrate the music of Johann Sebastian Bach and add to Portland’s growing reputation as a destination for classical music. The inaugural Portland Bach Festival will run June 19-24 at churches in Portland and Falmouth. One concert, “Bach and Beer,” will be scheduled outdoors on the waterfront and feature Portland craft beers. Two or three years ago, while having lunch with Samuel Adler (faculty 1996-2014) and Derek Bermel, I mentioned that numerous composers say Bach is their favorite composer, and I asked for their thoughts. Sam immediately answered, “Whether or not he was the favorite composer, he was the greatest one.” It is of particular interest to note that Beethoven, not often given to praise, referred to Bach as “the father of harmony.” Brahms and Bartók, among many others, paid homage to Bach. Why Bach? I believe that no one has ever depicted the human spirit through music more deeply. I often compare him to Shakespeare: Styles and language may change, costumes may change, stagecraft may change, but his words and characterizations are forever. So too with the music of Johann Sebastian Bach. Whether it’s written in a sacred or secular mode, vocal or instrumental, serious or lighthearted—and whether it’s played on original instruments or ones that didn’t exist in his lifetime— Bach’s music speaks of eternal truth. 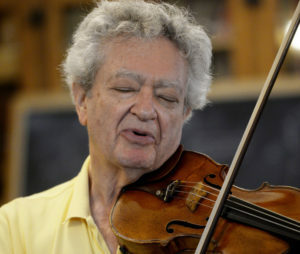 Lewis Kaplan is one of the great violin instructors – and performers – of our time. His passion for teaching and playing is evident in his initiative with this project based in New York and Cologne. America’s probably most renowned music conservatory and Europe’s largest music academy joined in a multi-year project: that’s the brainchild of Lewis Kaplan, the world-famous violinist and professor at New York’s Juilliard School. “For me, it was always important to think about the future in a positive way. And it’s obvious: Our students are the future,” he said to DW after a concert by his protégés in the chamber music hall of Cologne’s Academy of Music and Dance. In a ceremony at The Juilliard School on April 29, 2009, Lewis Kaplan will receive the Knight’s Cross of the Order of Merit of the Federal Republic of Germany, awarded by President Horst Kohler, from the hands of Consul General Dr. Horst Freitag. Mr. Kaplan, a Senior Professor of Violin and Chamber Music at his alma mater, The Juilliard School in New York, is being honored for his continuous commitment and dedication to the development of exchange programs between German and U.S. music students. In the context of these programs, talented students from the “Hanns Eisler” Academy in Berlin and The Juilliard School in New York created joint chamber music projects in master classes, given by Juilliard and Hanns Eisler faculty, and performed together. Mr. Kaplan was instrumental not only in teaching these classes but also in organizing the exchanges and enlisting sponsors. Given the importance that performing in New York and Berlin has for both the young musicians and the audiences in both cities, this exchange program has been particularly enriching. 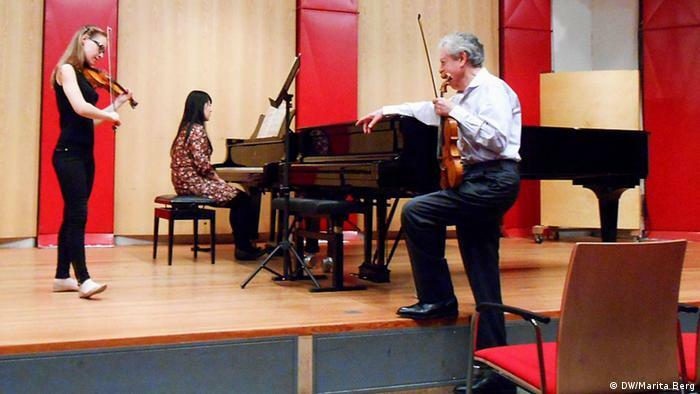 "Taking a chamber music class at Juilliard with Lewis Kaplan was wonderful."